I don't have many photos for Miss Blue's because I didn't even plan on blogging about it. It's owned by my best friend's grandmother. My best friend, Kayla, was my freshman roommate, and we've been friends ever since. And I've been eating at Miss Blue's the entire time - 6 years now. Kayla's grandmother actually owned a different restaurant in Hundred, but then bought out her competition: Miss Blue's. Miss Blue's is located in Hundred, and I'm sure it's one of the few - if not the only - restaurant in town. But it's also fantastic. Everything is homemade. It's clean, tidy, the service couldn't be better, and everything I've had is absolutely amazing. My favorite item? Their Rogers Salad. Its lettuce, tomato, cheese, hard-boiled egg, chicken and french fries. 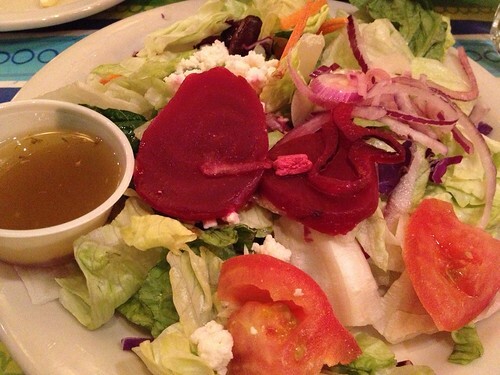 It's the unhealthiest salad, but it's delicious. It's simple but fantastic. I get one at least every couple of months. 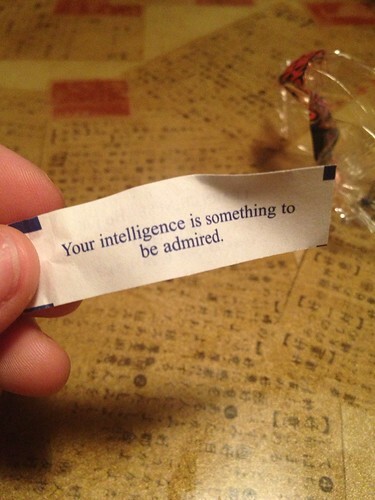 And considering I'm not up that way often, that says something. 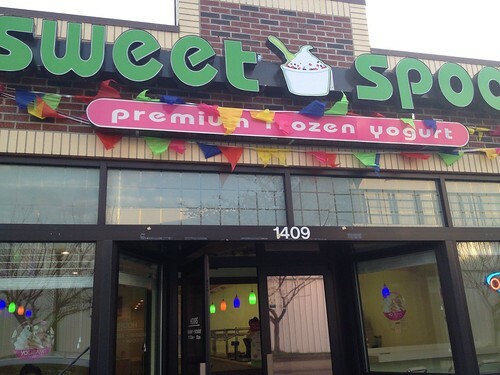 Located on the same stretch with Main Kwong and Umami, Sweet Spoon is the newest addition to that block trio. 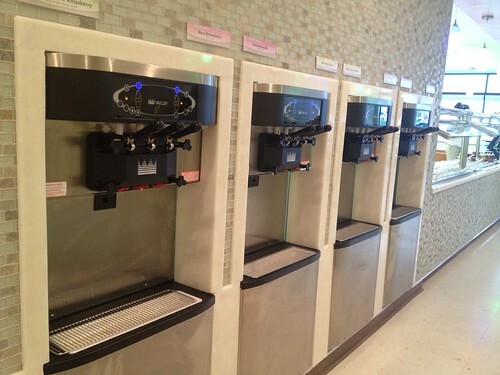 In fact, the owner of Main Kwong, Carina Kwok, opened the the self-serve frozen yogurt bar. In typical froyo fashion, folks can grab a cup of their choosing and fill it with any combination of yogurt and toppings they desire. I believe Sweet Spoon has about 12 different flavors, and toppings include candy, nuts, syrups, fruits, chocolate, coconut - anything you can thing of. And you place it on the scale and pay for it by weight. I reiterated that I think the froyo should sell portioned cups so I can have one side that's fruity and one that is chocolately. I consistently try to mix them, and it never works out well. This time I just went for the chocolately side. The options were good - I've seen more, I've seen less. It could use a little more tidying. The toppings bar always gets messy when people are constantly helping themselves. 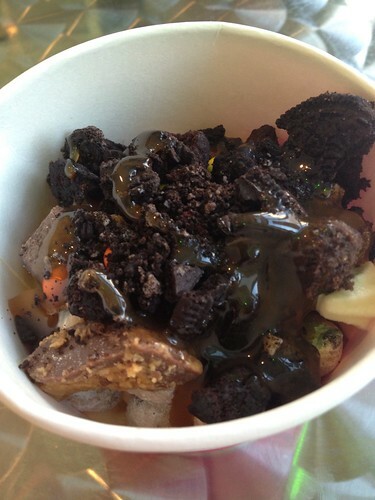 And the yogurt itself tasted pretty good, and the toppings weren't stale. That's a plus. They are quite prone to that when sitting out all day. Apparently they also have coffee and they plan to provide five iPads for customers to use while sitting at the shop's wi-fi bar. I'm not sure there are many other options for ice cream in the area, so give it a go. 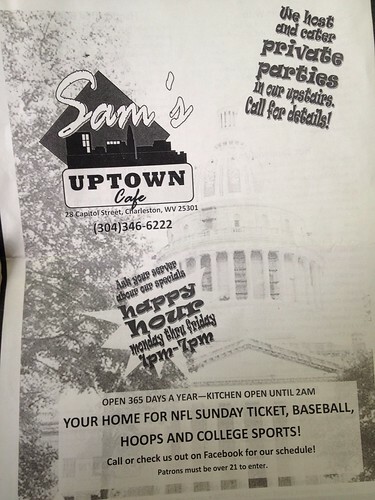 In more great adventures of lunchtime discovery, I found Sam's Uptown Cafe. 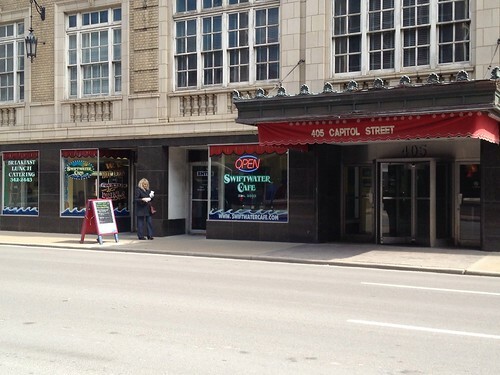 A few of my coworkers had mentioned this place, and it is only a couple blocks away from the newspaper office on Capitol Street. 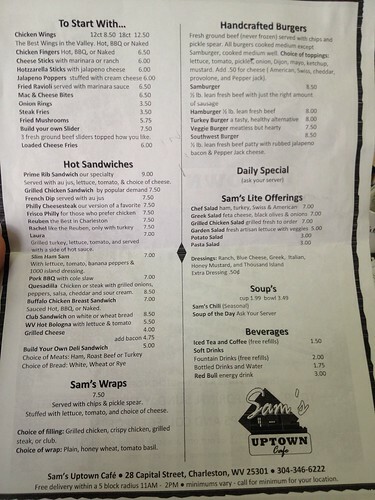 I called in my order (304-346-6222) for a Samburger - a fresh ground beef patty with some sausage. It's cooked medium well, and I got all the fixins - lettuce, tomato, pickles, onions, mayo, mustard, ketchup. And a .50 cent piece of cheddar cheese. It came with chips. By the time I got back to the office, it was starting to get a little soggy - from the millions of condiments I chose - but it was a soggy, tasty, burger. 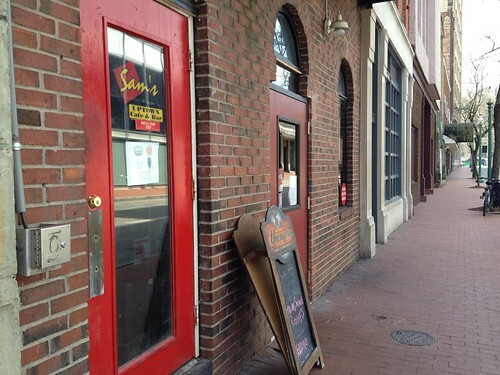 The burger was flavorful and well-seasoned, especially for what I was expecting from a bar. It was GIGANTIC. Gigantic. I couldn't even finish it. And I made a pretty valiant effort, and I definitely felt it for the rest of the workday. 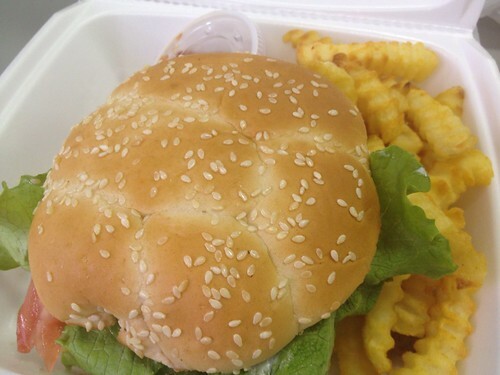 But if you're looking for a pretty good, basic burger that's enough to feed a family, check it out. 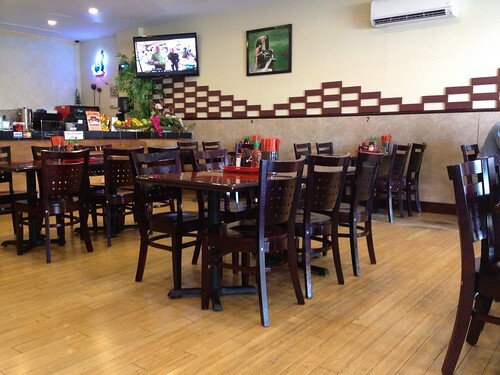 I can't rattle off too many Vietnamese restaurants in West Virginia, so I'm grateful to have such a unique, gem of a restaurant in Charleston. 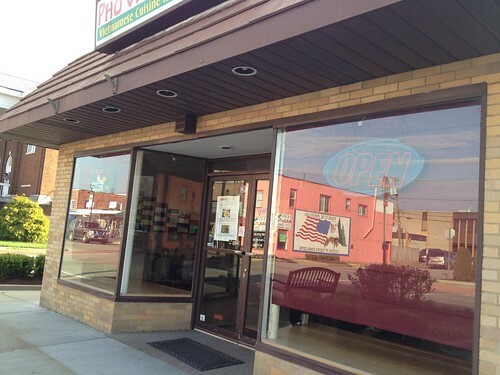 Pho Vinh Long located in South Charleston and there's a good bit of parking, so that's always a plus. My friend and I went for lunch, and there was only one other couple inside. 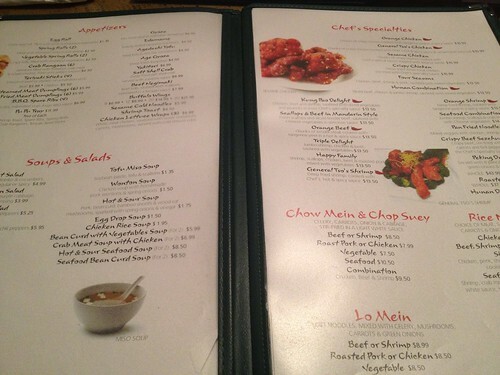 Looking over the menu, we really weren't sure what to get. 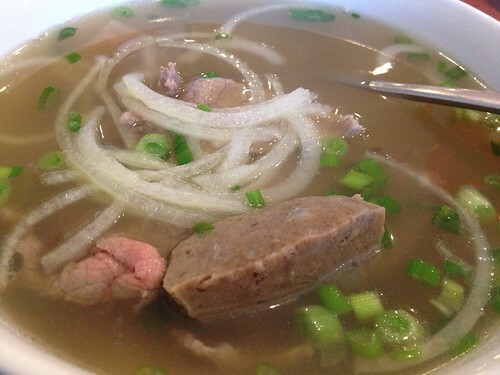 The woman waiting on us pointed out a few popular dishes, and I settled on the beef pho - a classic. It's pronounced "fuh." 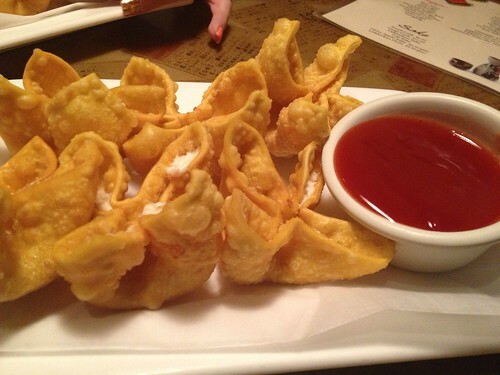 I also got an appetizer of little meat wontons - fried golden brown and served with a side of a sweet sauce. Tasty. Fried to perfection, crispy and I took a healthy helping of sauce with each bite. 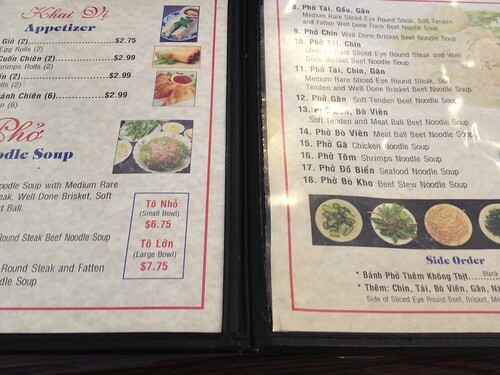 The Pho is nice for a chilly day. One big pot of steaming hot broth that cooks your beef, paired with noodles and onions is just what the doctor ordered. I think you have to be in the mood to have a soup for dinner. And one thing that threw me off was I kept anticipating soft noodles and getting mouthfuls of onion. Blech. Less onion would be better. I'd rather have it for flavor and not a main component of the meal. But it was still overall pretty good. And it's a great option for something different right in town. Since moving to Charleston, I am on a mission to find he best sushi in town. I miss Morgantown's options, but it gives me an excuse to try all the sushi restaurants here. 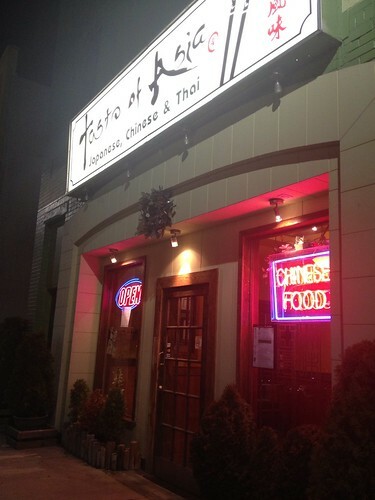 Taste of Asia is located in South Charleston, and when I first came to town, I was staying in a place in South Charleston. 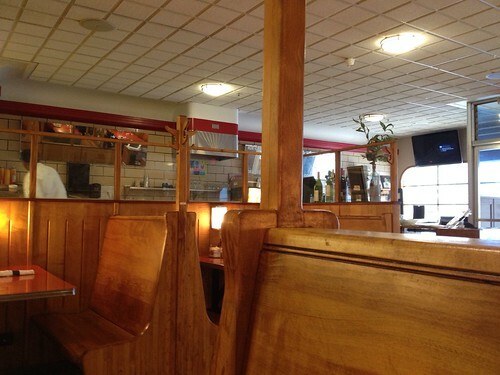 This was actually the first restaurant I visited on my own. So maybe it has a special place in my heart. 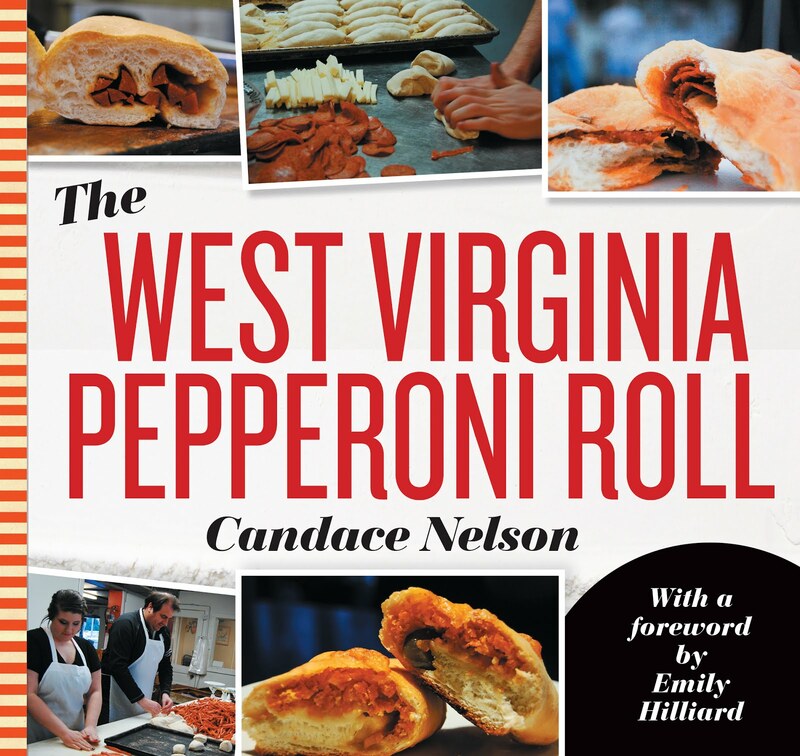 It also has other locations in Huntington and Teays Valley. This was technically my second visit, but it was the first time I sat inside. The inside isn't huge, but I kind of like that it's a little bit more cozy. We were sitting next to the sushi bar, and I was keeping a close eye on what the chef was producing - and everything look fantastic. 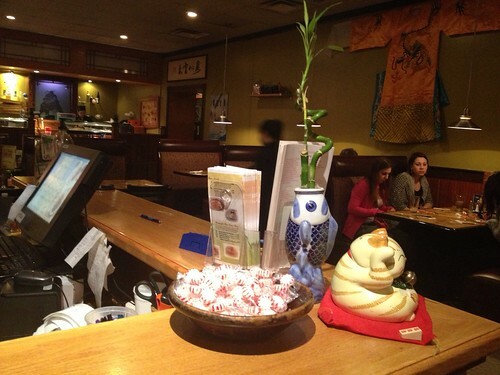 Taste of Asia has Chinese, Japanese and Thai food. I wanted all three. But what I was feeling this evening was some crab rangoons, chicken udon and a shrimp tempura roll. The crab rangoons were very creamy on the inside - which I'm really growing to love - but the outside was just too oily for me. 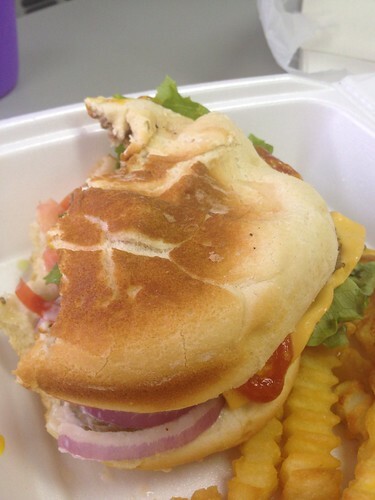 I felt like I was eating a little grease pocket. I really wanted the cheese to be the prominent flavor, but I tried to dab the oil off. Didn't work out so well. 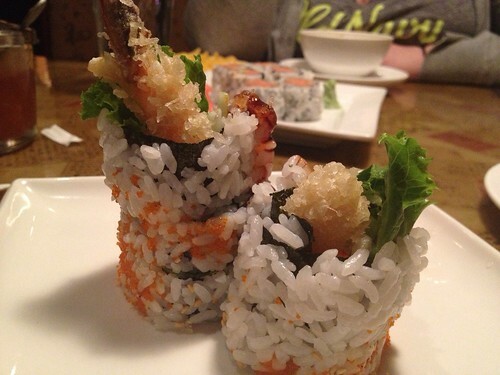 The sushi was of good quality. The blend of flavors were top notch. 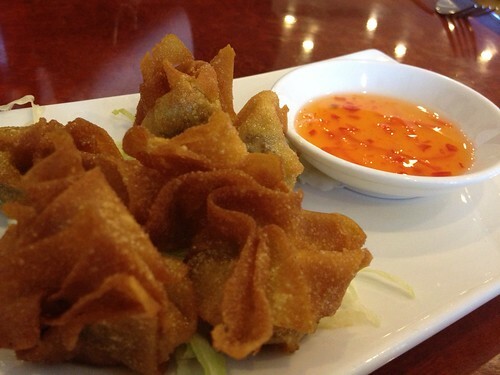 The taste of the crisp tempura on the shrimp, fresh veggies and a sweet, tangy sauce was hitting all the right spots. By the time I finished my appetizer and the sushi, I was pretty full. On this day, my eyes were much bigger than my stomach, though, because I still had my udon coming out. I've only had udon on one or two occasions, because I'm generally not a fan of soups. However, this is more of a noodle dish than a soup. And I like that. Once the giant pot came out, I knew I was in trouble. I took a few bites before asking them to box it up - or container it up. It was my lunch for the next day, and it was SO GOOD. Oh my god. Is all udon like this? Have I been missing out my entire life? The thick noodles taste like they're homemade, and they come in this broth with veggies and topped with a ton of chicken. It blew my mind. If you're worried about a soup dish filling you up, don't. 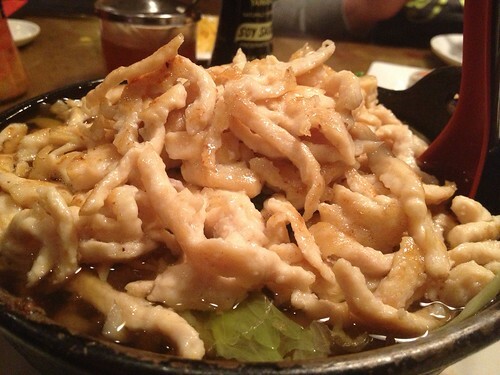 This is a noodle dish. With soup. And it tastes like heaven. A beautiful slice of Asian heaven. Maybe an Americanized Asian food heaven, but whatever it is, it makes my tastebuds sing. When I was first getting settled in Charleston, I was hearing about how unfortunate it was that the Quarrier Diner was closing. 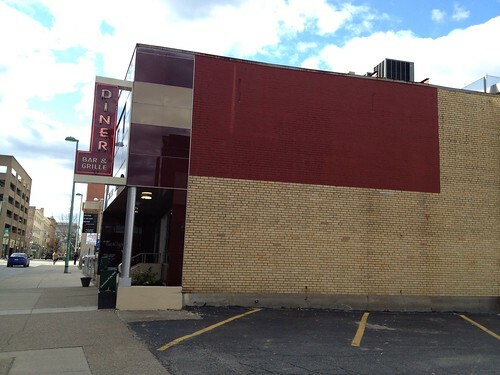 Located on Quarrier Street, the diner had a fairytale story of sorts. It was a dilapidated, art nouveau building that a couple bought in 2010. It had been built in 1946, and was on the Preservation Alliance of West Virginia's Most Endangered Properties list. The couple restored and renovated the building. 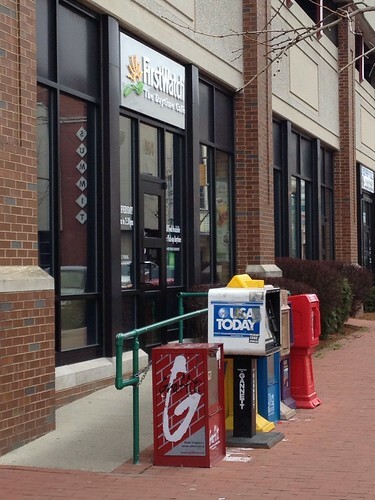 But they had trouble getting customers in due to the location, the owner had said. Before it closed, a friend and I went to check it out for my first and last visit. It was clear the staff was kind of down on their luck. The man who waited on us was cracking jokes about it closing and ran down the list of available items left on the menu. I understand them being out of a lot of food since they were closing; I just wasn't expecting that, I suppose. I settled on their macaroni and cheese. It was cavatappi pasta tossed with their four cheese sauce. You could also choose three toppings to add to it: spinach, peas, black olives, jalapenos, mushrooms and tomatoes. I wanted mushrooms and tomatoes, but they were out of mushrooms. So I just opted for tomatoes. It was good. 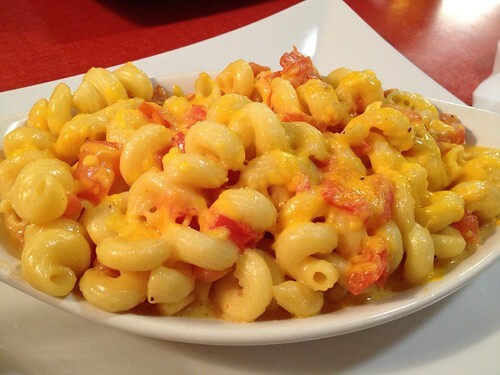 It tasted exactly like boxed macaroni and cheese with some tomatoes in. Velveeta shells and cheese with a different type of noodle. Was it good? Yes. Could I make it for a fraction of the price at home? Yep. But I won't knock it - it still tasted good. Unfortunately, I won't get another chance to go back. 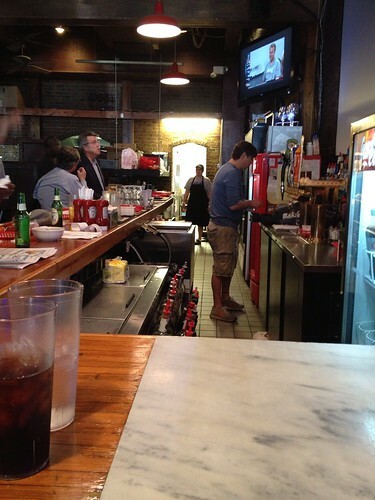 But they do still operated Timothy's - a bar directly below the restaurant. 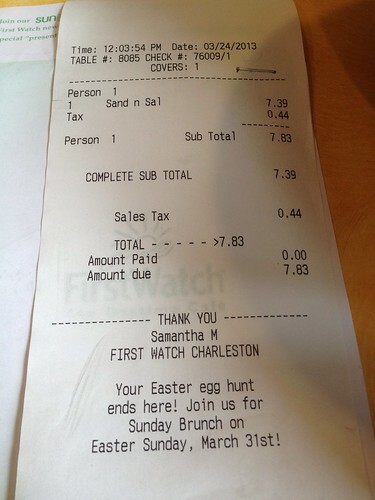 Though First Watch is technically a chain restaurant, there is only one in the state. And I consistently hear it being referred to as one of the best breakfast/lunch options in town. I went a little before the lunch rush on Sunday. 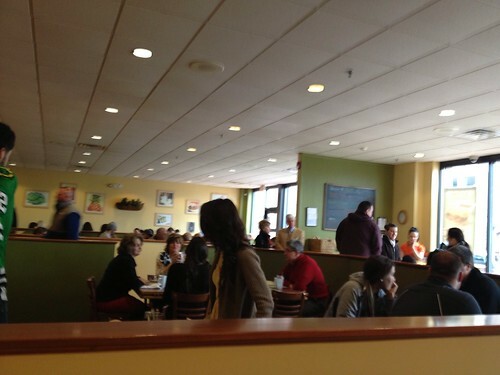 This place gets pretty packed so if you're needing your fix, check it out before the church crowd lets out. I found out later that their real stand-out offerings are breakfast items, but on this particular day, I opted for lunch. 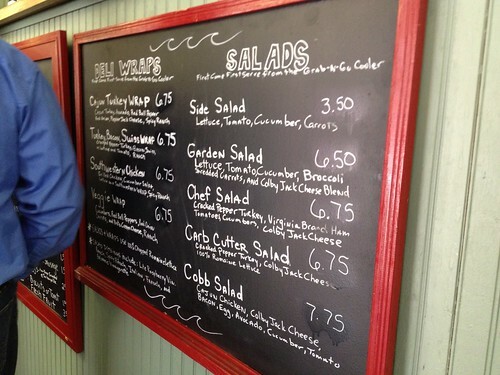 They have omelets, sandwiches and salads. I was a little worried that all I would see here are turkey sandwiches - or what I refer to as plain, boring sandwiches I could make at home. But the opposite happened. There were actually a few different things that sounded good on the menu , so I tried the "2 For You" where you can choose two of a selected list of smaller portion items. So, it's as close to I'll come to a sampler here. 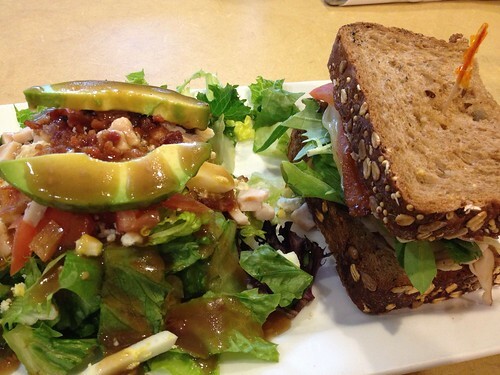 I ordered the "Monterey Club," which has turkey, bacon, avocado, lettuce, tomato, Monterey Jack and mayo on multigrain. And I also got the "Cobb Salad," with bacon, turkey, egg, tomato, avocado and bleu cheese crumbles. Both of which were actually tasty. The multigrain brain kind of blew my mind. I wasn't expecting to like it, but it was fresh and had some more flavor than what I'm used to with - well - bread. The sandwich was good, but it does kind of fall into the category of something I could make it home. But I probably couldn't have made it taste that good. The salad was my favorite. The ratio of toppings to lettuce was perfect. Usually you get a heap of lettuce with a couple pieces of tomato and call it a day. This salad was incredible. Everything was crisp, on point, blended together seamlessly and filled me up without feeling heavy. Really, pretty good. 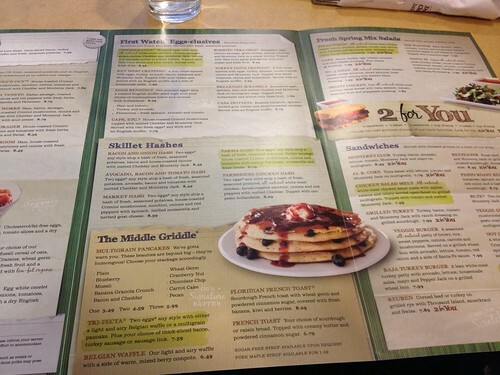 I will want to check out the breakfast offerings next time, though. Checking out here was kind of a cluster. It was very busy, and the person in front of me was trying to use many, many coupons. If you have cash, you have priority, but if you have a card, be prepared to wait. 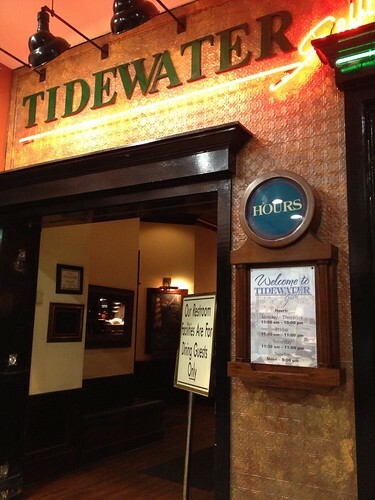 Tidewater is an institution in Charleston, and I had been wanting to go here for quite some time. I guess I should have taken it as a sign whenever I mentioned the restaurant, my friends said "ehhh..." I think this place falls into that it's-been-around-for-so-long-we-accept-it-as-good. 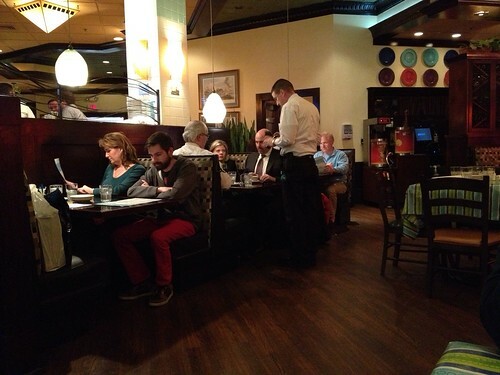 It's located in the Charleston Town Center Mall and specializes in, you might guess, seafood. Apparently it comes from the harbors of Boston, Chesapeake Bay, and George's Bank. According to their website, "Selections are procured by traditional "watermen" and selected by standards set centuries ago. A closely-knit, mutually accountable relationship has been forged between our company and two of the nation's top seafood purveyors - we inspect their New England facilities and they routinely examine our kitchen - to assure our guests of the highest standards of quality and freshness. 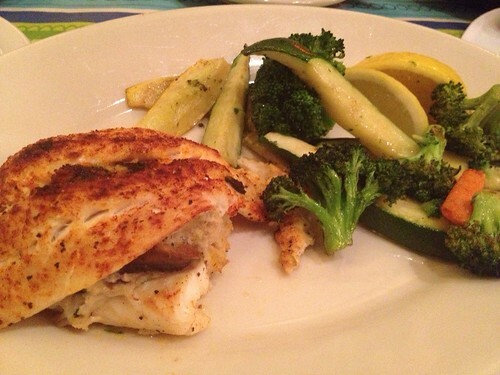 Our seafood is as close to the New England waters as your taste can travel." 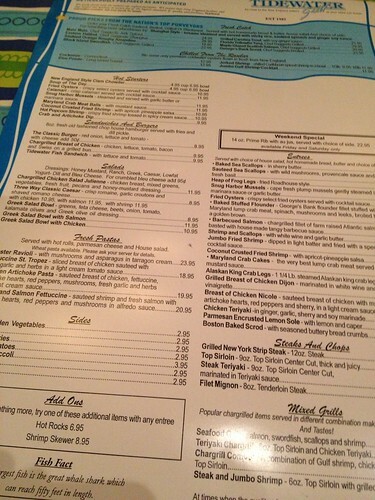 I looked over the menu, and there were a few things that looked pretty good - scallops, salmon, flounder. But the baked stuffed flounder stood out to me - George's Bank flounder fillet stuffed with Maryland lump crab meat, spinach, mushroom and leeks, broiled to a golden brown ($25.95). 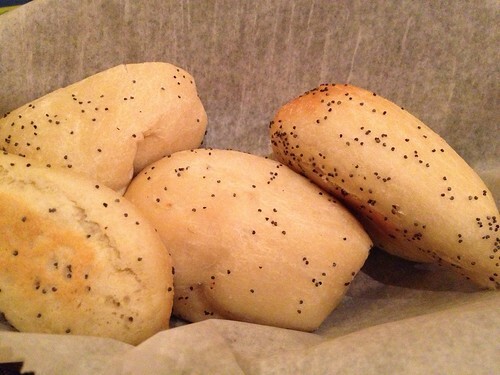 But before w get there - let's start with the poppy seed rolls. Yum. Warm, doughey, fluffy. Dab of butter. We got two servings. 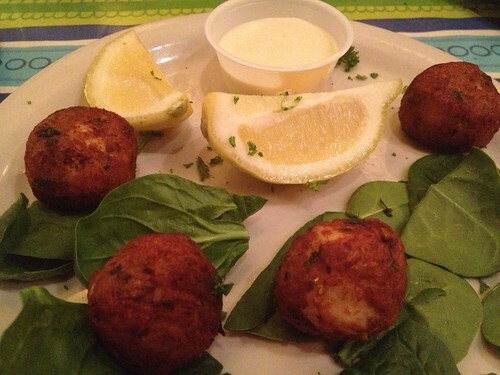 I ordered the Maryland crab meat balls for $12 as an appetizer. I was kind of shocked to see a total of four on the plate. Four. Everybody knows the crabcake is a bunch of breading, less crab. And $12 for that? Ha. It wasn't bad, the sauce wasn't either, but definitely not for the price. My dinner also came with a salad, and I went with their house salad with vinaigrette. I was happy with the nice assortment of veggie, with the addition of beets (yum! ), and the crumbled gorgonzola had the perfect bit of tang. I was pleasantly surprised with the house salad. My entree came with a side, so I opted for their veggies. 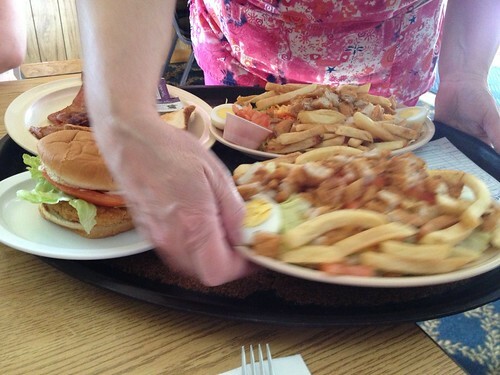 But when I got my plate, I was looking around to see where the rest of it was. I paid $26 for a small piece of fish with some vegetables? It was fine. Was it the freshest, most delectable piece of fish I've ever had? No. No, it wasn't. It was okay. It was maybe even under-seasoned. Dare I say bland? I was just very underwhelmed. Especially for footing a pretty decent bill. Luckily I got a few different components here to fill up with to almost make the price worth it. 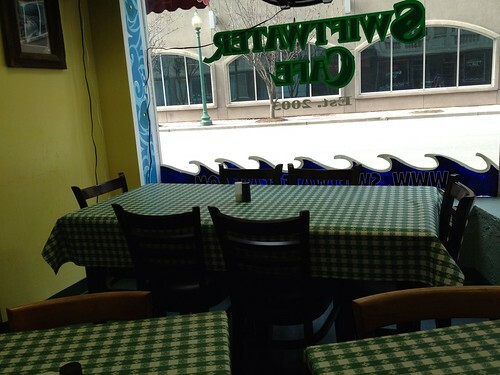 Another lunchtime discovery, Swiftwater Cafe is off of Capitol Street and serves breakfast, sandwiches, salads and wraps. 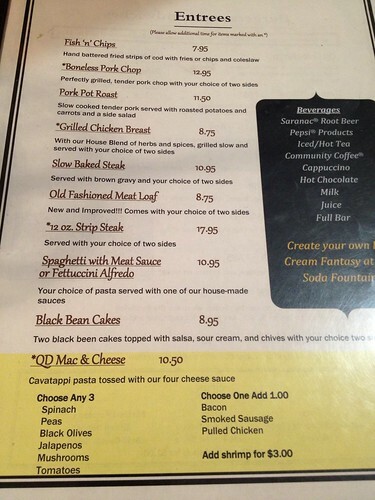 They have daily specials, and a coworker told me I must try their "Big Ed Burger." I waited until Wednesday and headed over for lunch. It has two entrances, which confused me a bit. But clearly they do a good business because as soon as I walked in, I lined up behind a dozen or so people already waiting to order. For a fairly small space, there is also a good bit of seating. 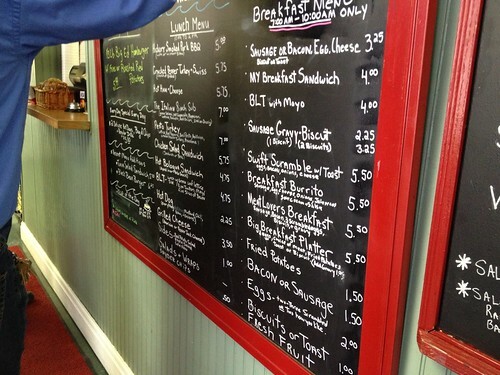 They cater to a lunch crowd, though (7 a.m. to 2 p.m.), so I wasn't waiting too long before I got up close enough to read their items from the black chalkboard. 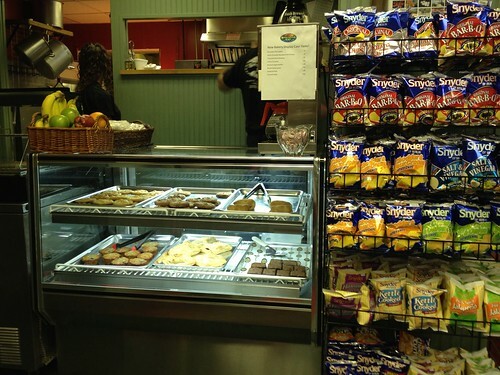 The folks behind the counter were super friendly - really fantastic service here. So helpful, nice and genuine. It wasn't a long encounter, but you just know when people truly care. And being new to town, that meant a lot to me. I paid, stepped to the side to wait for my order to be prepared, then took it back to the office. 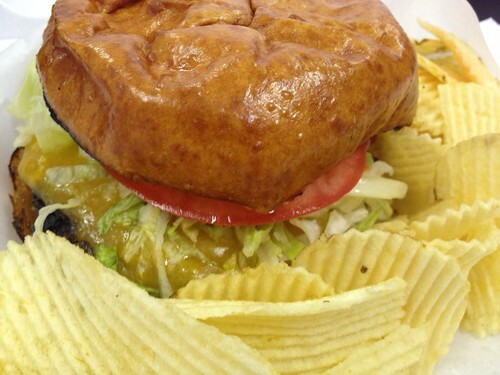 The Big Ed burger is a 1/3 pound beef patty with lettuce, tomatoes, red onions, pickles, mayonnaise, mustard and ketchup on top. Toppings were fresh - onions crisp - flavorful blend of all the condiments. By the time I got back to the office, it was starting to get a little soggy. That's my fault, though. And this burger was huuuge. I regretted stuffing myself with it - but it was just too good. And a lot of it. You can get fries or roasted red potatoes on the side. I got fries, which were fine. They were thick, crinkle-cut ones. I prefer less thick ones, but they weren't bad. Just personal preference. I'll go for the potatoes next time, though.